It’s a Saturday mornin…the coffee’s brewin, the hubby’s still sleepin, and the sun’s a shinin! I’m whistlin that one tune from Monty Python’s The Life of Brian…”always look on the bright side of life”…insert whistling sequence. There’s a sense of quirky-calm in the house and what better way to celebrate the jubilant morn than to roast up some early spring asparagus and top it with sunny side-up eggs and a few smatterings of grated parmesan cheese. Delicate, delightful, delicious! This dish looks so elegant, but it couldn’t be easier or more humble. There’s very few ingredients, it takes only about 10-15 minutes, and the reward is smiles all-around…I think you can actually watch the drowsy, tired faces wake up and rejoice in the simple beauty of fresh, flavorful food. Adjust the oven rack to the highest position (about 4 inches below the heating element) and heat the broiler. Lay the asparagus on a rimmed baking sheet and drizzle with the oil and sprinkle with salt and pepper to taste. Roll the asparagus back and forth to coat them evenly and spread out into a single layer. Broil the asparagus until they are beginning to brown lightly and a knife ­easily punctures the stalk, 8 to 10 minutes. Remove the pan from the oven and set the asparagus aside. Meanwhile, heat a heavy-bottomed nonstick 10-inch skillet over the lowest possible heat for 5 minutes. Crack open 3 eggs into a small bowl; crack the remaining 3 eggs into a second small bowl. Add the butter to the skillet and let it melt and foam. When the foam subsides (this process should take about 1 minute; if the butter browns in 1 minute, the pan is too hot), swirl to coat the pan. Pour 3 eggs on one side of the pan and the other 3 on the other side. Season the eggs with salt and pepper. Cover and cook for 2 1/2 minutes. The yolks will still be runny. 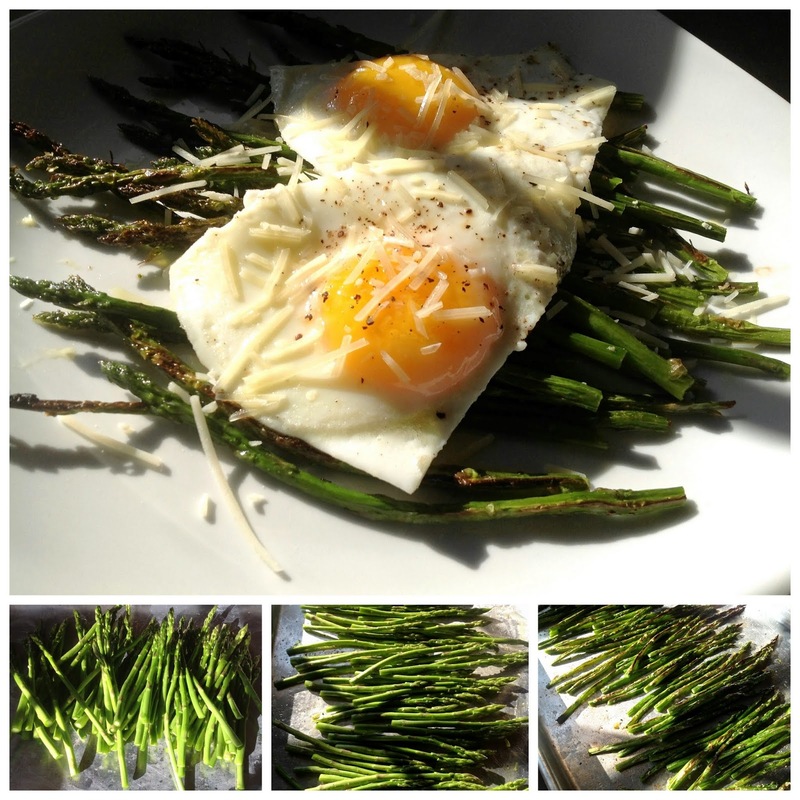 Divide the broiled asparagus spears evenly between 3 plates. Place 2 eggs on top of each pile and sprinkle the parmesan cheese over the eggs. Serve immediately, or you can put the plate under the broiler for about 30 seconds to melt the cheese (be sure to use a heat-proof plate). 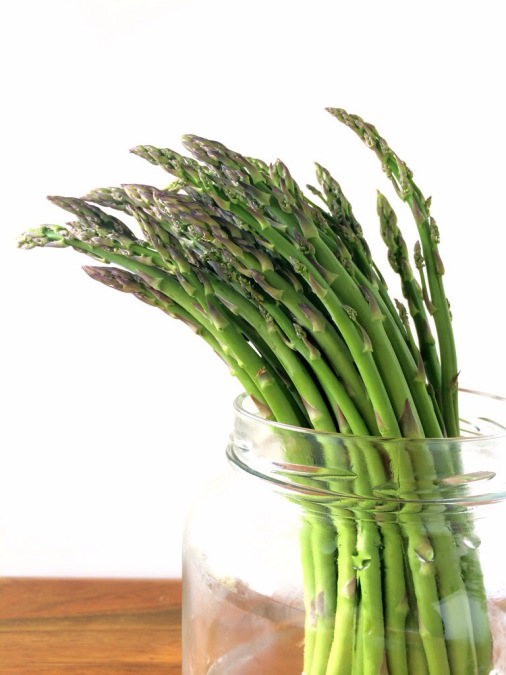 *Don’t discard the asparagus ends, use them for soup or stock!